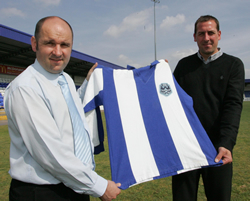 The latest players to sign for Chester are Greg Stones a defender who has played for Rhyl and TNS. Also joining the club is former TNS, Bangor and Rhyl striker Mark Connolly. Danny is a former Northwich Victoria, Morecambe, and Stockport County player. Rob will be joining Chester from Colwyn Bay, and is a tall physical player who finished top scorer with 23 goals for Bay last season as they gained promotion from the Unibond North League. Richard joins the Blues from Burscough FC. Daniel joins Chester from Bamber Bridge Football Club, and comes with experience of Conference football. Richard, joins from Cammell Lairds FC. 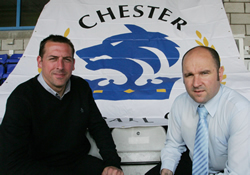 More signings are expected soon as Chester’s preparation for next season continue. Chester will travel the short distance to play Airbus UK on Tuesday 20 July. The match will kick-off at 19:30hrs and thanks to a generous offer from the hosts, half of the proceeds will be donated to Chester FC. Games against both Bangor City and Tranmere Rovers are also possibilities as manager Neil Young looks to put his new squad together through the summer. City Fans United (CFU) hold their Annual General Meeting tonight at the Home Guard Social Club on Canal Street, Chester. Doors open at 19:45 for a 20:00hrs start. New manager Neil Young will be in attendance and he will draw the winners of the Seals Lottery, and also the Member-Get-Member scheme for May.  Any other business All members are urged to attend the meeting and hear the latest new regarding CFU and Chester FC. As this is a members only meeting, please bring your membership card with you. Chester’s new management team of Neil Young (below left) and his assistant Gary Jones were introduced to the press at Deva Stadium today. In an interview later on radio Merseyside the new man in charge said he hoped to have his first five or six signings in place by the weekend. 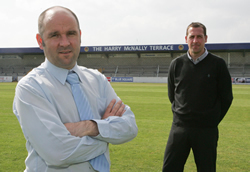 Chester have wasted no time in appointing their new manager, he’s former Colwyn Bay boss Neil Young and he brings with him his assistant, Chester-born Gary Jones, after the two clubs agreed their release. The pair spent 18 months at the Unibond Division One North side and recently guided the team to promotion via the play-off’s. Chester will play a pre-season friendly at Llanelian Road on Saturday 10 July as part of the deal. It has been confirmed that the club have appealed to the Football Association over their placing at Step 5 in the league structure. The appeal follows an enquiry for clarification on the criteria and subsequent reasons for the decision to be placed in Step 5, Chester FC await the response to this request. That was the overwhelming feeling among the 500+ supporters who turned up last night at the Guildhall to herald the launch of Chester FC, a new community club for the people of Chester. With the launch comes the new club crest designed by Martin Huxley who is a lifelong Chester fan, and City Fans United member. It’s a stylised version of the traditional wolf’s head with crown crest and is shown rising ‘phoenix-like’ from the flames. A superb evolution from the previous design. Grenville Millington, Andy Walsh general manager of FC United of Manchester and many others made speeches to the packed crowd and there was a tremendous reception for former goalscoring hero Daryl Clare who came over from Lincolnshire to be inducted into the CFU Hall of Fame. Here are some simple ways you can help your Club. Former player and goal scoring hero of the 2004 Conference championship season Daryl Clare will be in attendance as he is inducted as the third member of the CFU Hall of Fame joining Grenville Millington and Gary Talbot the two other players with the accolade. The meeting starts at 20:00hrs with the doors opening 30 minutes beforehand. This is open to all supporters, whether CFU members or not and entrance is free. Chester FC could have its first team manager in place by the end of next week. Chief executive Steve Ashton has received over 50 enquiries for the position and is already drawing up a short list of suitable candidates after the deadline for applications closed yesterday. Following the recommendation by the Football Association that Chester FC join Level 5 next season the Vodkat League have issued the following statement on their website today. “The League Management Committee has received a recommendation from the FA that the newly formed Chester FC should be placed at Step 5 in the National League System, in the Vodkat League Premier Division. The League Secretary has requested clarification from the FA on a number of points relating to this issue, and further details will be published on the league website once a response has been received from the FA. For the purposes of clarity, whatever final decision is made, it will not affect promotion and relegation issues already decided for the 2009-10 season. Given the current speculation surrounding this issue, it should also be pointed out that the normal process for the election of any club to our league is as follows. City Fans United have been informed that Chester FC will start next season at non-league level 5 at the highest, in the Vodkat League (The North West Counties League). This will come as a big disappointment to many who were expecting the new club to start higher in The Evo-Stik North or South League. They will now start at least four levels down from where they were when they were kicked out of the Football Conference. It is yet to be confirmed in the club start in the Vodkat Premier Division, though CFU have been informed that would be recommended by the FA. Other teams in that division, and our possible opponents next year include: Congleton Town, Winsford United, Alsager Town, Ramsbottom United and Nelson, the team Chester replaced when they joined the Football League back in 1931!. The First Division, which may still be a possibility, includes: Atherton Collieries, Eccleshall, Wigan Robin Park and AFC Liverpool. The Vodkat League was formed in 1982 with the amalgamation of the Cheshire County League and the Lancashire Combination. On hearing of the news, City Fans United (CFU) released the following statement this afternoon. 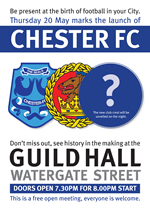 City Fans United are holding a meeting at the Chester Guildhall in Watergate Street on Thursday 20 May when Chester FC will be officially launched. The new club crest will be revealed to those at the meeting which is set up to celebrate the birth of the new club. Entry is free and is open to all supporters, whether CFU members or not. Those wishing to join the ever-growing organisation can of course do so on the night. Doors open at 19:20 in readiness for a 20:00 start. With just 12 weeks to the start of the new season, City Fans United are proud to present the official re-birth of Chester Football Club this Thursday at a public meeting at the Guild Hall, in Chester, commencing at 8pm with doors opening from 7.30pm as the people of Chester are invited to throw their support behind the club. This will be an historic night in one of the most historic buildings in Chester, which will include the dramatic revelation of the new club crest, and how we intend on building a football club from scratch in a short space of time. Blues legends Daryl Clare and Grenville Millington will be joining us on this momentous occasion, and we’ll also be giving a full update on the progress being made for the future of Chester FC, including our plans for the Community involvement and the CFU Junior Blues. It will also be a night where we'll be looking for the public to throw their weight behind Chester FC, as the more money that is raised, the better Manager Chester FC will be able to hire, and a bigger playing budget he will be given. Chester FC have advertised for a manager in today’s Non-League Paper, the closing dates for applications is 19 May. Those interested in applying should send their CV along with a covering letter to Steve Ashton, Chief Executive, Chester FC, Deva Stadium, Bumpers Lane, Chester CH1 4LT. Applications can be emailed to media@cityfansunited.com. With the lease of the ground now in their hands, the CFU and notified the Football Association of their intentions for Chester FC to play at Deva Stadium next August. At what level in the non-league pyramid they will be playing remains to be seen but it could be as high as the Evo-Stik Premier League – previously the UniBond Premier. In effect only one down from where they would have been had the previous club carried on and been relegated to the Conference North this year. It seems more likely though that Chester could start the 2010/11 season a division below that in either the Evo-Stik First Division North or South. 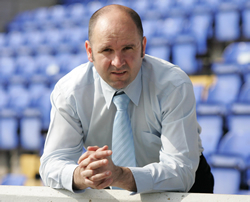 Steve Ashton has been named as the chief executive put in charge of seeing the return of football to Deva Stadium. Ashton, who was born in Chester and is a lifelong City fan, is head of sports partnerships at Bank of America (previously known as MBNA) and will fill the role for eight months at no cost to the club. Ashton, in his first official interview in the position told the Chester Chronicle: “I’m absolutely delighted to be taking this role as it allows me to put my skills into my football club,” said Mr Ashton, whose position at Bank of America means he has close relationships with a host of Premier League clubs including Liverpool FC. “A key to my role will be harnessing the business community and working in partnership with the business community to realise the potential of the club. It’s an historic day for football in the city of Chester, as City Fans United (CFU) have been granted control of the lease of Deva Stadium by Cheshire West and Chester Council for the next five years. The council have now urged the Chester public and local business to support and advise the new club on their venture. After months of dedicated hard work and relentless media campaigning by CFU, at both local and national level, the ambitious plans to launch a community club, Chester FC, this summer have taken a huge step forward with this news. City Fans United are delighted to announce that following meetings with representatives of Cheshire West & Chester Council, the lease to the Deva Stadium, will now been assigned to City Fans United. This will enable Chester Football Club to use the ground from a date to be confirmed. City Fans United are also interested in hearing from members of the business community who would be interested in discussing sponsorship opportunities with Chester Football Club. A number of flexible packages are available, please email media@cityfansunited.com with your interest and you will be contacted by a member of the board. Cheshire West and Chester Council have decided to offer a five year lease on the Deva Stadium to City Fans United – supporters group pledged to maintain league football in the city. The decision announced today (Wednesday) was made after detailed consideration of the business cases presented by CFU and Danish Consortium, Fodbold Selskabet. Both bidders presented their business case to a special panel led by Chief Executive Steve Robinson and including independent business men and a advisor with experience of the establishment of a Phoenix Club. Later both groups were questioned by panel members and asked to clarify issues raised during the presentation. “The Panel was impressed with the professionalism, enthusiasm and commitment shown by both groups. Consequently, reaching a final decision has not been easy. “The Danish Consortium combined an obvious passion for English football with some very innovative ideas and financial support, both immediate and potential. “We are extremely grateful for their very keen interest and the considerable time taken to formulate the bid and travel to the U.K to present their case. “However, it was the Panel’s unanimous view that City Fans United, were further advanced in terms of required management structure and overall ability to enter a team into whichever league is determined by the FA. “Without doubt, their pride in club and city is unrivalled, as indeed, would be the support for their proposal from the people of Chester and its surrounding area. “It was these factors, combined with the very strong community engagement element in their case which persuaded the panel to assign the lease of Deva Stadium for five years to the CFU Board. “CFU have promised a club ‘run by the community for the community’ with a multi-sport approach designed to reach all sections of our society from the young to the disadvantaged. “On that basis this authority will do everything it can to help, support and advise the new club and we urge the Chester public and businesses to do so as well.